Have you ever wondered how to choose the best fragrance for a successful fundraising product? The simple answer is to sell a product that people are looking to buy. With that said, there are thousands of fragrances from which to choose. How do you select a scent that is the most likely to sell? Narrowing down the options can be overwhelming for both the formulator and the buyer. One thing to remember is that large fundraising companies do market research to see what types of products make sense for their business model; Think about it. It does no good to offer items that aren’t popular or that won’t get orders because the point of selling the product is to raise money for something. So while you may not be a lavender fan, there’s a reason that it shows up time and time again, people buy it! Lavandula is a genus made up of about thirty species, and each species has individual varieties. This genus shares a family with many other square-stemmed kitchen herbs such as mint, sage, thyme, and marjoram. Lavender plants prefer well-drained to dry soil that is neutral to slightly alkaline. The plants need an open area that receives six to eight hours of sunlight a day. In Provence, France, lavender is found growing right out of the limestone rock! The market is huge with more than $76 million worth of lavender oil consumed worldwide in 2016. The Lavender essential oil market will remain highly lucrative beyond 2017 due to increasing consumer demand for natural and plant-derived Lavender oil products. Personal care products make up the bulk of the overall global demand for Lavender. By the end of 2024, personal care products expect to make up nearly $45.1 million of the global Lavender market. 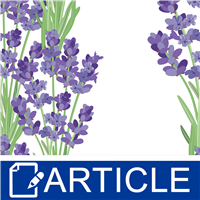 The ability of Lavender to be such a crowd- pleasing fragrance might be explained by a 1997 study in which 90 healthy young adults investigated whether they could influence trust with an odor. The hypothesis was that a calming scent would induce a more open state of mind, therefore increasing the level of confidence in the participant. The experiment took place in a space where either Lavender or Peppermint essential oil had diffused. The control group occupied an unscented environment. Compared to both Peppermint and the control group, exposure to the scent of Lavender increased interpersonal trust by 22%. The popularity of Lavender as a scent option for fundraising products is readily apparent through a Google search of “Lavender scent fundraising,” which returns over 457,000 results. If you’re at a loss for what types of lavender products are most attractive for raising money, the search results indicate that candles and body products are highest on the list. Another reason that Lavender might be a “safe” choice is that it appeals to a wide range of ages, it is unisex, and it is familiar to most people. Some other fragrances that fall into the same category would be vanilla or oatmeal & honey. Fragrances that many might seem to be “generic” do have mass-appeal, which is why they might give off the impression that they are overused or bland from a formulating or marketing standpoint. People are more likely to buy what they know. In fundraising, especially fundraisers for children’s schools or sports, buyers feel compelled to buy to help the cause, but might not want to receive something odd or unusual in exchange for their donation. Sticking with products that most perceive to be “safe” or “normal” helps increase sales, which helps both the creator of the product and the entity raising funds. Selecting a relatable fragrance that many people like, or that most people can relate to, increases the chance of the product selling. Good fundraising companies update their product offerings on a regular basis. Narrow your eld of focus to just a few products in minimal fragrances. Review your price point and determine how best to price your product so that everyone gets paid fairly. Product pricing should be expected to cover the cost of your materials including labor, your pro t and allow enough cushion for your fundraisers to raise a suitable amount per unit towards their fundraising goal. Once you’ve successfully created a fundraising program, be sure to review what is working. What products and fragrances sold? What didn’t sell? Listen to feedback from your fundraisers, and look at order history and frequency to figure out what’s working. The goal is for your products to sell themselves so your fundraisers don’t have to. 3. Guéguen N. The sweet smell of ... implicit helping: effects of pleasant ambient fragrance on spontaneous help in shopping malls. J Soc Psychol. 2012 Jul-Aug;152(4):397-400. PubMed PMID: 22822681.